Christmas Day is such a Big Day. It is traditionally celebrated by families around Australia with a get together on Christmas Eve and then again with family on Christmas Day. Some people on Christmas Eve will be madly dashing around to get friends and family last minute presents. Others will be finishing the office or factory work year with friends and some will be celebrating Christmas around the Christmas Tree on the Eve. Christmas is a season of giving and people swap presents or even do a Kris Kringle where presents are combined. Families will want to break bread traditionally over Christmas Dinner and sometimes it's a good idea to head out to a restaurant and leave all the meal preparation to those venues. Roasts followed by pudding will be the order of the day. To help, christmasday.net.au has provided details of venues that will provide services for your Christmas. Enjoy! Here are a few great ideas for things to do for Christmas! 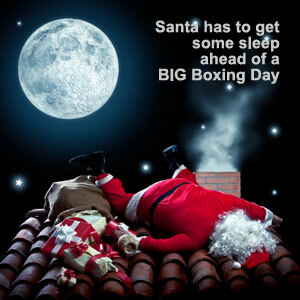 After Christmas Day is Boxing day where people sometimes relax and rest and maybe graze with Christmas left overs. Others want to get active. Checkout the ideas. End of Year Sales... Summer bargains. Sale suggestions over the End of Year period. Christmas Specials galore!